Panasonic has launched a budget Android smartphone named T9. 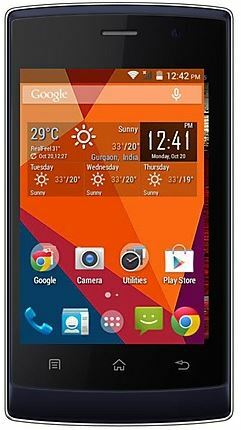 Available online for just ₹3,750, T9 is perhaps the cheapest phone offered by any multi-national phone brand in India. The latest Panasonic device also sports a 2MP camera along with a LED flash on the rear; and has a 0.3 VGA camera on the front for VOIP calls. Though it offers the dual sim connectivity option, T9 do not feature 3G connectivity option and one need to stick to 2G for connectivity needs. Measuring 179x63.7x10.1mm, T9 sports a 3.5-inch HVGA LCD display with 320x480 resolution and the device looks decent online. Powered by a 1.3 GHz dual-core processor and 512MB RAM, the phone also offers 4GB of storage on-board. Impressively, it also comes with Android KitKat 4.4 operating system. It also offers the regular connectivity options like WiFi, Bluetooth, FM Radio and 3.5mm port for connecting any uniform headphone. Powered by a 1,300 mAh Li-ion battery, Panasonic T9 is listed on Indiatimes.com for just ₹3750. The device currently comes in Black and Blue colours only. Meanwhile, the Japanese company has also launched another budget handset, T40 few weeks back with a proce tag of ₹5990. Currently, this phone is listed on several sites for much less rate than the quoted price. Exclusively tailored for the Indian market, T9 also supports 21 Indian languages.